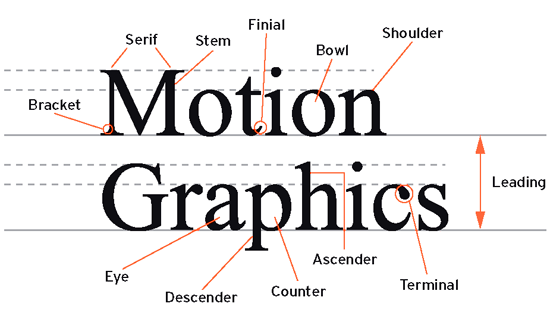 Do you love your lettering? I admit that a year ago, I did not. I began seeking out others who could help me, like Joanne Sharpe, and if you need some inspiration, then she has a fabulous book to get you inspired. but this is my newest one so I will enter "Advice from a mountain." I teamed up my Susan K. Weckesser papers and Unity stamps, Helmar glues and threw in a dash of Frosted Designs Kits to create this cute little quote book. It's the week-end, anyone got any plans? This has been one of my most fun experiences in life, painting one of the huge bear sculptures that will be auctioned off to raise money for charity. My main sponsor, Meals on Wheels has been a delight to work with and I want to say thank you for picking me to paint your bear! I am honored!! I also want to thank another sponsor who stepped up and made this project affordable and easy, Deco Art Inc. I don't know what I would have done without your help! They supplied all my paints and it was definitely appreciated! First, a shout out to the washi tape loving Tamiko McCurry who sent me loads of washi tape ( I never had used the stuff before and was delighted at how it helped with the lettering. ) I stretched out the washi tape and was able to write on it too in order to correctly space my words. It peeled right out afterwards with no damage to the paint! I also want to thank Yvonne Armitage for sending me a pen, that literally saved my life with the small details of the Tiger Swallowtail butterfly. If I had to do the fine lines with a paint brush, well, I think I would have given up. I had plenty of odd looks from my fellow artists when I used a ball point pen too, lol but it worked like a dream! I had one artist ask to use it on her bear but it didn't work on her chalky acrylic paint, so another shout out goes up for the Deco Art Multi Surface Satin paints!! Here is a slide show presentation of the bear's creation. 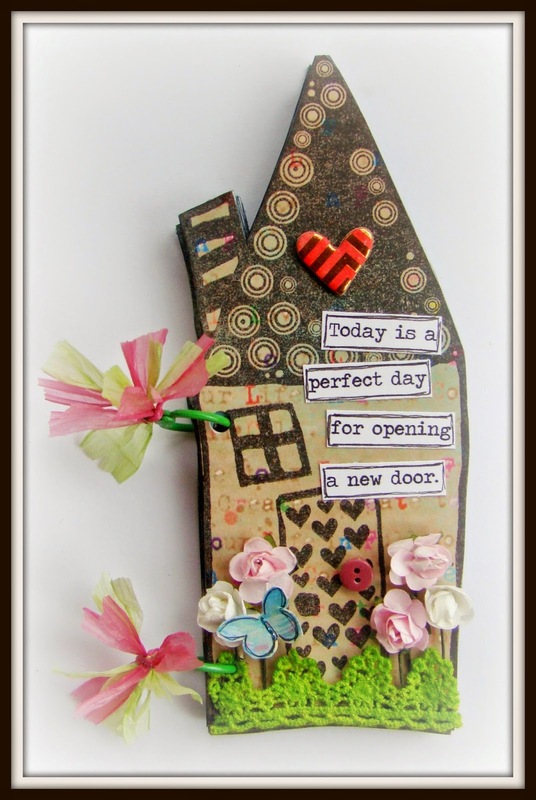 I just LOVE this house stamp by Susan K. Weckesser called Heartfelt Warmth and just about use it on everything, seriously, it's that cute!! I used the same ink that I stamped with to "re-color" the flower as the original blue did not match. The design on the house came from the Grandma's Needlepoint stamp and instead of using an acrylic block I just held it in with my fingers so I could press the end of the stitches onto the house instead of drawing bricks or something like that. I love the embossed ink and the tiny sentiment which I printed out, then cut out, inked the sides and doodled along the edges before gluing them down. The striped twine just adds a little more whimsy to the tag. There is no Sundays with Sandee today, I hope everyone is having a wonderful day. This is my big bunny head that I made about 6 years ago, and I revamped it a little this spring with a new paint job and some fresh flowers. ♥ I love seasonal door decor! After church, I am off today to go have Easter lunch with 2 of my art besties at the Arboretum and hopeful the weather is going to cooperate with us and give us a nice sunny spring day. Here's wishing you a wonderful Easter! I don't even remember making the background on this art journal page, it was so long ago, but it sat in my art journal hoping to become a page one day. Frankly I wasn't sure that day was actually going to come at all...it sat, and it sat. I would flip through my journal and run across this page and shrug and move on....until today. I had a couple of small scraps leftover from Susan K. Weckesser's Beautiful Daydreams and just couldn't throw them away either. ( A pattern is emerging, I don't throw things away very well, lol ) So, I fussy cut them out, pop dotted and doodled on them... and they seem to fit well on the abandoned page. I also had some fabulous stamps like this one from Grandma's needle point and I thought she would be perfect for holding the kite, so I stamped her on flesh colored paper and then colored her in with some PITT pens. I also have this very old stencil that just looks like a gust of wind blowing and it fit so perfectly with my theme using my Sakura pens to draw it in. And for our lettering homework from The Art of Whimsical Lettering, I used p. 80, the Wonky Printing to complete my mantra. Joanne's book is full of great lettering ideas and definitely worth buying plus you get to play along with us and see everyone's wonderful lettering journals over on the FB page! I am off working on my bear, the deadline is approaching!! You can visit the Frosted Designs blog to see my finished birdcage and see how I decorated it with the Beauty of Nature kit. 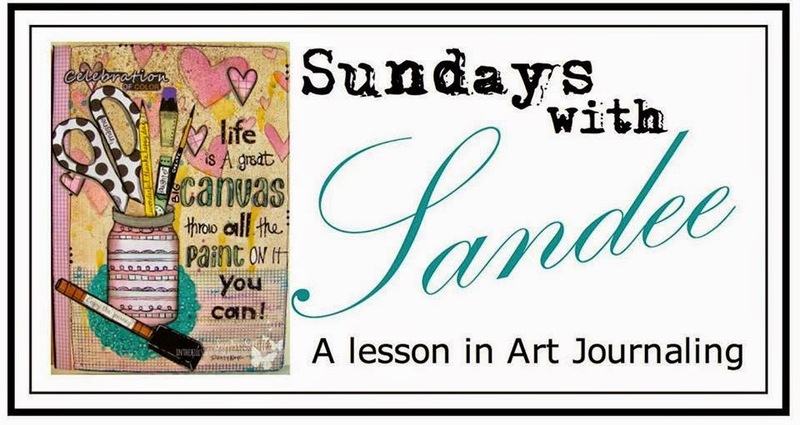 Sundays with Sandee - getting inky! Hope you hop on over to Frosted Designs blog, I have a some great tips on using those Tim Holtz Distress Marker plus 2 ways to use your stencils! 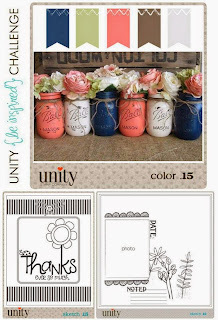 And wait for it....an awesome way to use that Distress Marker spritzer, with NO MARKERS! HA! I am sorry, I know I have not been blogging like usual but I am just a little busy painting my bear for the Bearfootin' event for my hometown. Starting on yet another adventure....teaching. I'm not over fond of teaching in person, there is no edit button when you are "live". lol But that won't be for at least another month and if it all comes together. Do you ever feel "called" to do something? Doing this class with my ladies from church has been on my mind a lot, so I figure it's something I need to do. The heart shape I made from card board so they can trace around it easily and the wavy lines came from an OLD journaling stencil from EK Success. I used Dylusion Ink Sprays ( as a water color ) along with a water brush, and my pens are from my SAKURA-Pigma Sensei Manga Pen Set. Keeping the ingrediants simple and the journal small will hopefully keep the non - artistic ladies from getting over whelmed. Yep, it's that time again for lettering! I admit, it's become a favorite time for me, I am loving my lettering more and more! You can too, if you are willing to practice it. I'm always surprised that someone would practice drawing and learn techniques but feel that their handwriting is hopeless....it's just word art folks! I love starting a lettering journal, a place to keep handy all those whimsical fonts that I see everywhere! So easy to pull out whenever I need some inspiration! And, as promised here are the letter identification charts for your easy reference. The Autism Awareness Ribbon — The puzzle pattern reflects the mystery and complexity of the autism spectrum. The different colors and shapes represent the diversity of the people and families living with the condition. The brightness of the ribbon signals hope — hope that through increased awareness of autism, and through early intervention and appropriate treatments, people with autism will lead fuller, more complete lives. Both of my background papers came from gelli prints using the new line of Deco Arts Media Fluid acrylics. They are a lot of fun to use in your gelli printing and this sign shows why. After putting my colors down on my plate, I lightly brayered them in one direction only. The first several pulls will give you a very bright and vivid background, After it dried I used a white pen to trace around some puzzle pieces to create the background. But it's the last pull that gets me, you know when you have dried bits of paint left over? Just squirt a healthy layer of water onto your gelli plate and press your paper down to get a dreamy soft swirl of color. Your paper will most likely curl after soaking in all that water, but just let it dry and then press it under some heavy books and it will flatten back out again. Lettering completed with a Sakura Gelly Roll pen, wood butterfly from the Frosted Designs Moments in Time Kit. This is my little fairy garden that I created over on the Helmar blog. If you want to know how I made it then please go visit me over there. I will let you in on a secret that only you, my lovely followers will get to see, which is what I did to the gazing ball, ( btw it's a finial that broke off a lamp ). This is the gazing ball before, nothing much to look into, is it? I wanted a special treat for anyone who got close enough to peek into the ball so I glued a sticker onto the bottom, and wow, it magnifies beautifully doesn't it? As for the sign in her garden "As you wish" is a quote taken from the movie The Princess Bride where the farm boy uses it as a euphemism for "I love you".